India is today the 5th largest generator of e-waste in the world. Extended Producer Responsibility (EPR), coupled with targets for Producers, offers huge opportunity for product take-back from the market and from Producers. Besides, huge prospects in e-waste market are waiting to be tapped. A Collection centre offers the scope of a handsome income in addition to contributing to the cause of green environment. As part of latest E-waste Management Rules (2016), an e-waste collection centre does not require any license from the State Pollution Control Board. This presents a lucrative opportunity to the entrepreneurs who seek to reap good returns from the burgeoning e-waste market. Be a part of the revolution and an upcoming industry. 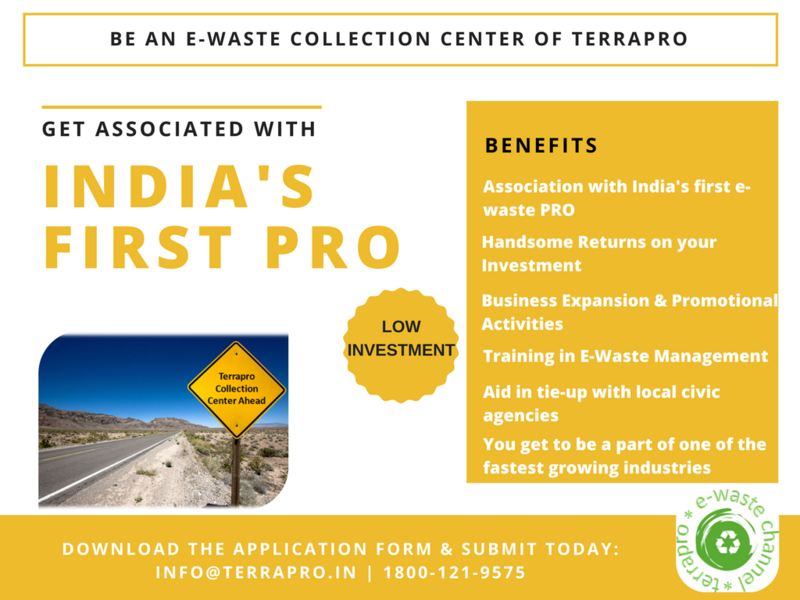 Associate with Terrapro, India’s first Producer Responsibility Organization (PRO) and be an active contributor to a pollution free earth. We provide pan India pickups of e-waste. To schedule a pickup, dial our Toll Free Helpline 1800-121-9575 and get your e-waste pickup scheduled as per your convenience. Copyright © 2019 Terrapro Recycling Solutions Limited.